WIPs & Books: Sinister Santa! I've been working on another Christmas decoration to accompany my Snowman pattern, and am having a little trouble with his face. I've said on many occasions that my knitting is spoiled as soon as I have to sew anything onto it, and this is certainly the case with Santa. He has been knit since Saturday, the pattern is written and ready to go, but I just can't get his face sewn. Each time I try (and there have been many attempts now) I end up with a murderous looking creature which I wouldn't want hanging on the tree! He's in time out. I'm going to make something else while I ponder his evil little eyes *shudder*. I'd like to get on with reading Case Histories too, but very much doubt there will be time until the weekend. Last week I mentioned Wild by Cheryl Strayed, and now that it's finished I've been recommending it to anyone willing to listen. This video has a short overview of the journey Cheryl writes about in the book, and if you've read it already but haven't seen the photos of Cheryl, her mother, Lady, her tattoo and pictures from the PCT, you'll probably enjoy it too. Thanks to those who wished Archie well at Puppy School. Tonight it's his third class and he's doing well. As I'd already taught him some things, he's quick to pick it all up, although he is incredibly excited about all the other puppies, and having so many distractions is quite a challenge. As a typically Schnauzer, he's rather noisy when excited! Hope you are all having a great week and I'll be back tomorrow to launch the 2013 Festive Gift Guide. I live seeing Archie's pics. He is so full if life and darn cute. Susan B. Anderson has a great video tutorials on how to start and stop embroidery on a toy. And I believe Fresh Stitches has a great pic tutorial on how she embroiders her amigurumi. I have the Pins on my Tutorial Knitting board and my Tutorial Crochet board. I loved Wild. I'm a backpacker myself so I really enjoyed reading about all of her rookie mistakes because, of course, I made them all at one time too! Wild was such a great book! Thanks for sharing that clip, I hadn't seen it yet. Good look with your sinister Santa! Oh yes, the faces are very delicat business. I don't know what you have tried for your faces so if you have already done this ignore me. I always put pins in to get the placement right before I start sewing. To sew eyes I use three stitches, one longer one with a shorter one above and below, it depends how big your face is as to the exact dimensions to use. For a mouth a just use two a longer one with a shorted one below. 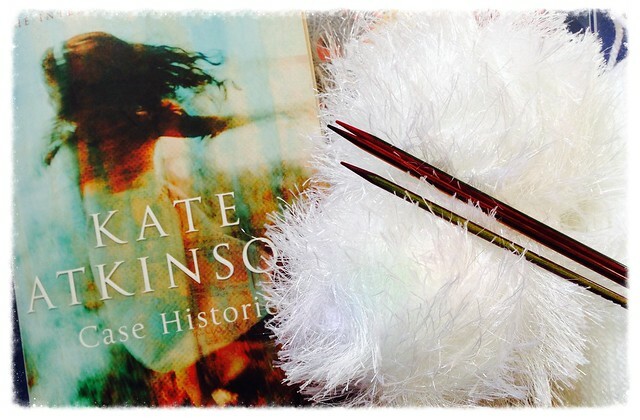 I love Kate Atkinson she is a great author it is a while since I read Case Histories but I remember enjoying it! It was good to hear I'm not alone about sewing! I made some cute chicks to hang on some Easter twigs - except as soon as I put the eyes on they become demonic looking creatures. Certainly not cute and cuddly chicks! I stick to mittens and blankets now!